Submitted by Fred on Wed, 09/11/2013 - 4:19pm. People concerned with maximizing their home security have been moving to gated communities in large numbers. The U.S. Census Bureau states 11 million households resided in gated communities in 2009, an increase from the seven million reported in 2001. It would look like living behind a barrier would be more secure, but is it really? There are two types of gated communities being constructed in the U.S. The first type is for the wealthy and influential. These have been the typical gated communities with high gates, tall landscaping, and security guards patrolling the grounds. People who live in these communities want to be shielded from the prying eyes of the public. The second type of gated community often looks like a typical apartment complex or subdivision with a fence around it and a gate to get in. These communities will have a variety of security levels, and are intended to draw people who want to feel safer behind a gate. When you are looking for a home security system, SecurityCompanies.com connects you with several companies that offer everything from remote-controlled door locks to surveillance cameras. The goals of these home security systems are to dissuade thieves from trying to break into the house, and make it harder for them if they do make an attempt. These options are listed in increasing expense, so only the most exclusive communities use the last option. Most communities implement the first option, where residents let themselves in and out of the gate. 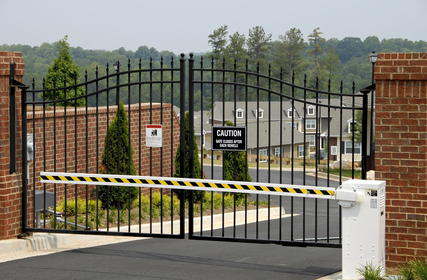 How Much Security Does a Gated Community Offer? The effectiveness of a gate is based on the ability for it to keep out unwanted people. It's all about access. Burglaries seem to go down the first year of a gated community, then begin to rise back to the levels found outside of the community. The speculation is that during that first year, people are giving out the code to get into the community to pizza delivery people, pest control, lawn care, house cleaning, and dog walkers. By then end of the first year or two, several people have the code, and the gate is no longer keeping out the non-residents. Another break-in practice is tailgating, where two cars try to get through the gate before it closes. The first car is a valid resident with a card key or access to the code. The second car may not be, but the first car is not going to stop to check on that. The second car gets into the gate, and it may contain people who don't live in the community. The Wall Street Journal reports on an Orlando sheriff's report over a four-year period that says burglaries within a gated community happen at the same frequency as in ungated areas. The bottom line may be that a gated community gives the residents a feeling of being more secure, rather than a tangible level of security. This is all the more reason for residents to maintain a good security system at home. Would you feel safer in a gated community? Tell us why or why not in the comments. Jamie Mendleson: Jamie is a mom and home improvement writer who hopes to inspire her readers to make positive changes.